Working on the banks of the Darling River in Outback New South Wales. 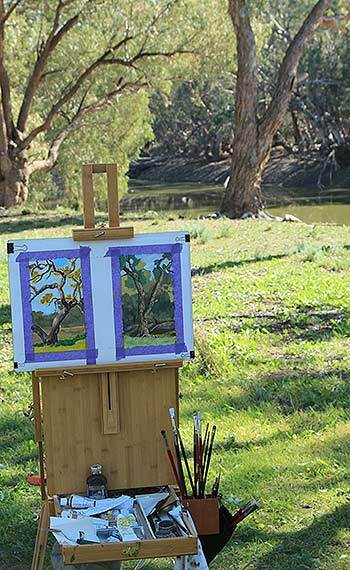 Plein Air studies of the amazing array of tree forms that follow the banks. Delightful way to spend some time except for all the noise! I don’t mean the occasional splish from the fish in the river or the odd bellow from wandering cattle, nor the raucous carry-on of all the birds – no, driving me nuts are the bees attacking my work. Scratch, scratch, scratch, bloody scratch. The little buggers are hell bent on scratching off the dry paint and taking it all back to the hive – I work on loose sheets of canvas with multiple works on one piece at times. What the bees like is yesterday’s work that has dried off. They don’t care about what I am painting now. I don’t mind a bit of interaction with the fauna – although it can be a bit of a shock when a snake pops out from under your chair and disappears through the legs of the easel – but endless buzzing and scratching is hard to take; and the scratching is quite loud from the persistent little critters. Not to mention they aren’t fussy where they walk. I have little Bee footprints on paint passages where there shouldn’t be any! And where the heck are they all coming from? The owner of the Cattle Station I am working on comes by and I’m telling him about the Bees and he cracks up. Turns out he has a bunch of commercial hives just up the river with thousands of bees. Some of that honeycomb could end up interesting colours….